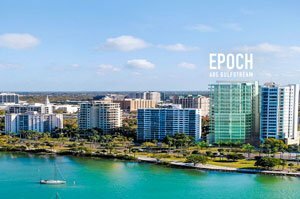 Epoch Sarasota is a condominium project which Seaward Development set at the former site of the mid-rise bayfront condo Versailles at 605 South Gulfstream Avenue. This Sarasota-based developer paid over $9 million in 2017 to buy out the 14 original Versailles homeowners and pave the way for the construction of new Sarasota condos for sale in a sought-after walkable downtown neighborhood. 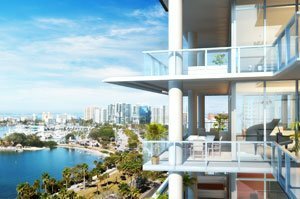 Touted as one of the last developments of its kind in the downtown bayfront area, Epoch Sarasota is planned as an 18-story luxury condominium. Seaward Development’s timetable for this project is aimed at a groundbreaking in the first quarter of 2019, with the condo units expected to be completed and move-in ready by 2021. Pre-selling of these residences began in earnest in April with their listing in the MLS of Sarasota condos for sale. Their unit pricing starts from the $3 million range. The Epoch developer has tapped Nichols Brosch Wurst Wolfe & Associates of Coral Gables, Florida, for the architectural design of this condominium. Its building’s style is an inspiration from the timeless appeal of the Sarasota school of architecture. Epoch’s blueprint calls for the construction of 24 customizable, half-floor and full-floor condo units which all live like single-family homes. The half-floor choices occupy levels 4 to 11 of the condominium building and oriented either north or south. Those with a southern orientation features three bedrooms, a den and three and a half baths. These condos have a living area of 3,689 square feet plus 408 square-foot terraces. Half-floor units oriented north provide 4,338 SF square feet for four bedrooms, four baths and a half bath, as well as 601 square-foot terraces. The prime full-floor Epoch condos for sale occupy levels 12 to 19 of the building. Each of these units’ living areas measure 5,379 square feet of air-conditioned space good for four bedrooms, four baths and a half bath. These upper-floor condos also each flaunt 1,998-square-foot terraces. Access to each condo is through a private elevator which opens to the unit’s gallery space. Interior highlights include glass walls and 12-foot ceilings which meld to provide unobstructed bay views and dramatic sunsets. The wow factor of Epoch condos for sale extends to the units’ oversized great rooms and indulgent master suites with walk-in closets and dressing space. These residences also impress with their smart-home technologies, designer kitchen appliances, and baths with two water closets, make-up area, double vanities, free-standing tub and walk-in shower. A porte-cochere and a grand lobby staffed 24/7 bring luxury and style to living in the upscale Epoch residences. The condominium, moreover, provides a residents’ club well-suited not only for social occasion or a weekly bridge game but also for board meetings or formal gatherings. Epoch Sarasota also provides a wellness center with massage and workout training areas. Other facilities for rejuvenation or recreation in this condominium include a large pool and spa and a scenic rooftop terrace. Garage parking plus a limited number of private garages are likewise available in this condominium which is definitely exciting addition to the pool of Sarasota condos for sale. Below are the current real estate listings available at Epoch Sarasota.